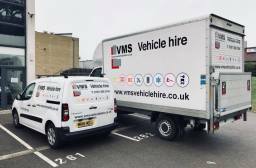 Great Prices, Great Service VMS Vehicle Hire is a forward-thinking car rental company with sites across the UK, experienced staff and competitive all-inclusive rates. £10 OFF/day for new customers! New customers get £10 OFF per day on their first hire for 4X4, Pick Up Truck or Dual Control Vehicles across any of our VMS Vehicle Hire sites! Enquire at 0800 622 6242 today!